It’s been more than a year since the This Girl Can campaign showed us how, with a bit of sweat, determination and jiggling flesh of all shapes and sizes, women can achieve their sporting goals. Since the campaign, 2.8 million 14-40 year old women say they have been inspired to increase their amount of exercise or play sport. In England, women playing all types of sport, from cricket to athletics, is at an all-time high of over 7.2 million. 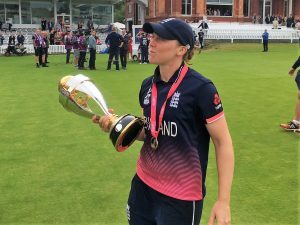 The increase in women’s participation in sport means more spectators watching women’s sport; TV audiences are lapping up the opportunities to watch sporting events like the Women’s Cricket World Cup Final. Lord’s was a sell out and more people tuned in to watch the final than the average Premier League game. 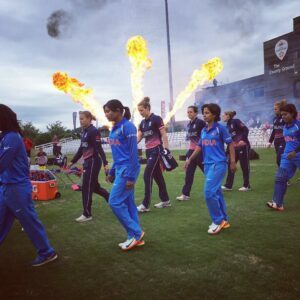 And not only were they wowed by the efforts on the pitch, they were wowed by the special effects – flame jets, pyrotechnics and streamers provided by Entertainment Effects accompanied the Women’s England cricket team’s fantastic win. ‘sour grapes’ decision by the FA to ban women from football altogether. Fortunately, that decision has since been overturned and football is once again the UK’s biggest female team sport. In July and August, the women’s Euro’s was aired on prime time TV, England reached the semi-finals with a record 27,093 in attendance and a peak audience of 4 million tuned in to Channel 4, to watch the England Lionesses’ hard-fought loss to the Dutch host team. As women’s participation in sport and its TV audience grow, event organisers and promotors are tapping into the many ways to both visually enhance the game and maximise sponsorship opportunities with event branding and special effects. Participation in women’s rugby has risen by 200,000 to 2.2m since 2009. The England Roses, the current Women’s Rugby World Cup champions, began to defend their title on 9th August. We hope they have got what it takes to lift the trophy for a second year running. our impressive Olympic medal haul in London 2012. Unfortunately, our female medal hopefuls missed out with Holly Bradshaw, Sophie Hitchon, Laura Muir and Katarina Johnson-Thompson robbed of podium places but the atmosphere in the stadium was incredible. Championship organisers bathed the stadium in purple lights, themed giant screens with vibrant purple and orange swirls, finalists posed for pre-final photos in front of screens boldly announcing the race title before entering the stadium via pyrotechnic walkways to reach the starting blocks. 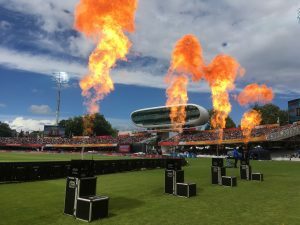 Whether you are planning a sporting event at an international, national or local level, be prepared to visually enhance the occasion and wow your spectators too. Make a call to our experienced special effects team to discover how we can help you make the very most of your event.